As Sunday’s Grand Prix came to an end, Max Verstappen was already on the radio to his team on the cooldown lap issuing thinly veiled threats of violence against Esteban Ocon. Ocon, in an attempt to stay on the lead lap of the race, was fighting harder than necessary with race leader Verstappen. The ultimate result of that on-track fight was both drivers spinning off and Verstappen losing a substantial lead over ultimate race victor Lewis Hamilton. Either the team or the broadcast censored what Verstappen was saying to the television audience, but the meaning was certainly clear. 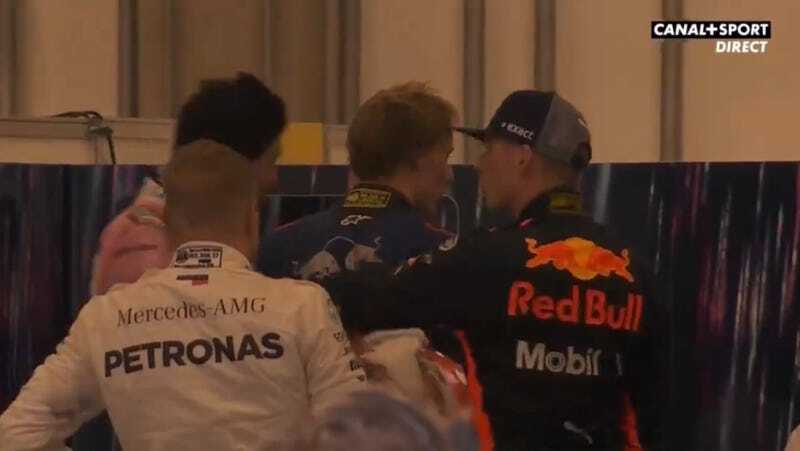 Following the race, and before the podium celebrations, Verstappen went looking for Ocon. From the video below, you can see what the result of that discussion became. It is pretty obvious that both of these drivers are in their early twenties, and they have a bit of maturing to do if they want to reach the pinnacle of the sport. What isn’t immediately obvious is whether or not Max has been shoved by other drivers when he ruined their races with idiotic crashes. It’s also pretty obvious that Lewis Hamilton is the king of shade with this clip from the post-race cool-down room.